A century ago today* Dragutin Dimitrijevic — better known by his code name “Apis” — was shot on the outskirts of Salonika (Thessaloniki) along with two lieutenants in his legendary Serbian terrorist organization, the Black Hand. Not to be confused with mafia extortionists of the same name, the Black Hand was the cooler brand name of Ujedinjenje Ili Smrt — “Union or Death” in the Serbo-Croatian tongue, referring to the network’s objective of aggrandizing the small Kingdom of Serbia with their ethnic brethren who, circa the fin de siècle, still answered to the Austro-Hungarian Empire. This national aspiration would midwife the First World War. Though it wasn’t formed as an institution until 1911** — it had its own constitution and everything — some of the Black Hand principals had entered the chessboard dramatically by conspiring in the 1903 assassination of the unpopular King Alexander Obrenovic and his consort Queen Draga. This operation is remembered as the May Coup and numbered among its leaders our very man, Apis. (English Wikipedia link| Serbian) Apis caught three bullets in the chest during the murderous palace invasion, but the hand wasn’t the only thing tough about him. In victory, these conspirators grew into a powerful faction of a more bellicose state, the most militant exponents of Pan-Serbism — a spirit perforce directed against the Austrian polity, which called South Slavs subjects from Trieste to Montenegro. Belgrade, then as now the capital of Serbia, was at this point a border city, with the bulk of the future Yugoslavia lying to its north and west, in Austria-Hungary. I, (name), by entering into the society, do hereby swear by the Sun which shineth upon me, by the Earth which feedeth me, by God, by the blood of my forefathers, by my honour and by my life, that from this moment onward and until my death, I shall faithfully serve the task of this organisation and that I shall at all times be prepared to bear for it any sacrifice. I further swear by God, by my honour and by my life, that I shall unconditionally carry into effect all its orders and commands. I further swear by my God, by my honour and by my life, that I shall keep within myself all the secrets of this organisation and carry them with me into my grave. May God and my brothers in this organisation be my judges if at any time I should wittingly fail or break this oath. 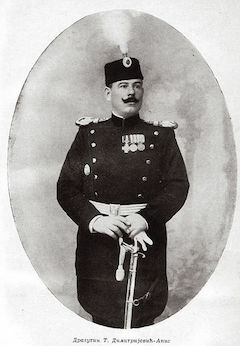 On the pregnant date of June 28, 1914, the Black Hand grasped at its historical destiny to redraw that noxious border when a cell of Bosnian Serbs whom Apis — a mere captain at the time of the 1903 coup, he by now commanded Serbian military intelligence — had dispatched for the purpose assassinated the Austrian heir presumptive Archduke Franz Ferdinand during his visit to the Bosnian capital, Sarajevo. Their objective was the same as it had ever been, to avenge themselves upon their occupier. Moreover, Serbia had allied herself with Russia, and Vienna’s inevitable declaration of war over the provocation could be expected to draw Russia into a Great Power war, perhaps with the effect of shaking loose Austria’s Balkan provinces. It did that, and it drew in the whole of Europe besides. Apis’s assassins shattered the Habsburg empire and made possible a postwar Yugoslavian kingdom. That the Black Hand itself was one of the Great War’s casualties in the process was the littlest of ironies. Its aggression had long placed it in a delicate relationship with the state which could never really be expected to acclimate to a permanent network of enragees looking to author wars and political murders. By 1917 the Prime Minister Nikola Pasic saw an opening to move against Apis. Perhaps he feared resumed Black Hand subversion if Serbia negotiated a peace with Austria, or wanted to get rid of the guy who could tell exactly how much he, Pasic, knew about the Archduke’s assassination before it happened. It was an effective ploy, no matter the reason. Alleging a bogus Black Hand plot to kill Serbia’s prince regent, a Serbian military investigation rolled up Dimitrijevic along with one of his original May Coup cronies, Ljobomir Vulovic and the alleged would-be assassin Rado Malobabic, a man who really had been involved in planning the Archduke Franz Ferdinand hit. Dimitrijevic was known to remark privately that whatever the charge sheet said, he was really being executed for that fateful day in Sarajevo. Malobabic succumbed after the first five shots, while the two others suffered longer, twenty shots having to be fired at each of them. No one was hit in the head. The execution was over at 4.47 in the morning. * Different sources proposing numerous different dates in June and even July can be searched up on these here interwebs. We’re basing June 26 on primary reportage in the English-language press (e.g., the London Times of June 28, 1917, under a June 26 dateline: “The Serbian Prince Regent having confirmed the death sentences passed on Colonel Dragutin Dimitriovitch, Major Liubomir Vulovitch, and the volunteer Malobabitch for complicity in a plot to upset the existing regime, these were executed this morning in the outskirts of Salonika”). The sentences were confirmed on June 24, and both that date and its local Julian equivalent June 11 are among the notional death dates running around in the wild. ** The Black Hand from 1911 was the successor to Narodna Odbrana (“National Defense”) which formed in 1908 in response to Austria-Hungary’s annexation of Bosnia. Carstens, i live in a small monarchy and am a full monarchist. Whether the Black Hand was republican or not it was still a terrorist organization like AlQuaeda or Daesh. And for your information Queen Marie Antoinette is my favourite heroine and is even on my Facebook page.I have some admiration for the British royals as well. But it all ties down with a long gone European confederation of which both Hapsburg and Hanover were former heads-of-state and my country was part of And you made some historical mistakes as well. The IRA also bombed in Dublin. And Thomas Paine defended Louis XVI against the death penalty. And unfortunately your comment has little to with either the Black Hand or Serbia.By the way Montenegro is a hybrid between a republic and a monarchy. IRA= Irish meaning from Ireland, the first victim of the trechorous British Empire. Republican, a often misunderstood form of government. The essence of a Republican form of Government is a government which strives to eliminate all customs, institutions, and ideologies of exploitation. The constitution of a Republic emphasises institutional checks and balances to prevent a person or group of people from obtaining the power to exploit other people. The Repblican Constitution also encourages maintaining the power of enlightened leaders to oppress those who would attempt to subvert the goal of eliminating exploitation from society. A Republican form of Government is not compatiable with a monarchist form of government , even a constitutional monarchy, such as the modern United Kingdom. The essence of a monarchist form of government is to make stability its God. It is a stabilty that protects customs, institutions, and ideologies of exploitiation to the last breath. If a Head of State as oppossed to a Head of Government was actually neccessary why not give the job to someone who actually deserves the job rather than someone who was born in to it. It has been almost 250 years since Thomas Paine ripped the idea of heriditary monarchy to shreds. Why have the elites of much of Northern Europe protected this stupid idea? What are they hiding? Could it be relationships of power that are not visable to the masses? Finally, Army, an army if properly run, is a collective organization of the soicety run by enlightened elites for the protection (and benifit) of the masses. The masses are to be protected from those that would exploit them. Do the words foriegn and domestic ring a bell? If the Republican Government of the Republican Army is doing a good job then the army does not have to do anything. In a Republican society the Army works for the government on a day to day business. But if a government should become corrupted in a Republican Society the Army must exsersise its responsiblity as the Regent of the society. If the Generals fail to act when action is neccessary the Colonels do not need to sit on their asses and watch. The same is true of the majors. This vile organization, the equivalent of the IRA, AlQuaeda and Daesh has been singlehanded responsible for the First World War. Its extreme nationalism, total disregard of other nations and of human values is the reason for the destruction of Europe. I can not find any words how to describe that i loathe them. The only mitigating circumstance is that the genocidal Ottoman Caliphate oppressed the nations of the Balkans so much that they turned extreme nationalists..